Play Elvis Slots Online | 80 Paylines to WIN Big! Get out your blue suede shoes and start dancin’! Elvis slots has all the top Elvis hits playing in the background while you play! Win amazing cash prizes and FREE Spins today! Get all shook up and play Elvis Slots! There are amazing chances to win loads of FREE Spins and prizes! This rockin’ slot game has an amazing 80 paylines for incredible winning opportunities! Plus, you can enjoy the classic Elvis tunes playing in the background which makes the game even more fun! 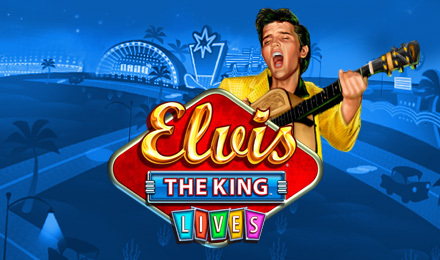 The Elvis Record is an important symbol that can help you win loads of FREE spins! Play the Jukebox Feature to hear one of four hit songs, Hound Dog, Blue Suede Shoes, Big Hunk O’ Love and Teddy Bear Depending on which song is played, you can win amazing prizes! Play Elvis slots today!